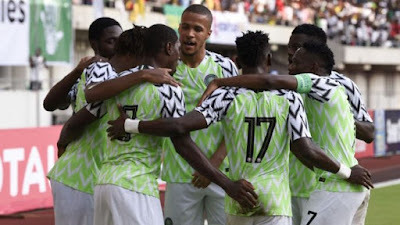 The Super Eagles of Nigeria defeated the Pirates of Seychelles 3-1 in Asaba yesterday to end their 2019 Africa Cup of Nations (AFCON) qualifying campaign on a high note. The Eagles had already sealed their place in the 2019 finals before yesterday’s clash at the Stephen Keshi Stadium in Asaba, Delta State. Odion Ighalo opened the scoring in the 35th minute from the penalty spot after Wilfred Ndidi was brought down in the box. At the end of the match Nigeria defeated Seychelles 3-1.
even if they qualify will they ever win the cup?